A mouth-watering low-calorie traditional lumpia recipe with a slight twist. 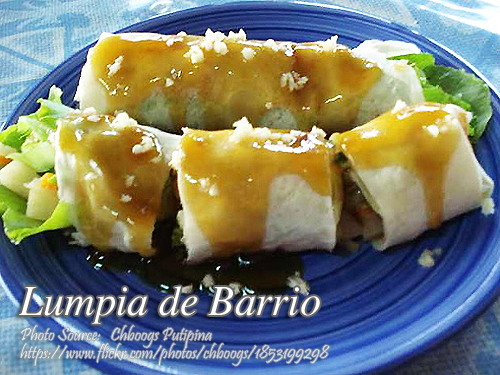 This is a special lumpiang sariwa and it absolutely contain no meat and its all veggies. This lumpia recipe also have procedure on making lumpia sauce and home made eggroll lumpia wrapper. In a wok, heat oil and saute garlic in canola oil in medium heat. Add onions and browned tofu. Pour in half of the broth, celery and salt. Simmer for a while. Add carrots and turnips until tender. Stir in green peas, pechay and corn. Pour in the remaining broth and basil. Remove vegetable mixture from heat, drain and cool. Lay eggroll wrapper on a plate. Place a lettuce leaf and ⅓ cup vegetable filling. Tuck one end and roll tightly. To keep egg rolls soft and fresh, wrap in wax paper. Mix sugar, soy sauce and water and bring to boil. Add the cornstarch solution and stir continuously until thickened the peanut and crushed garlic. In a bowl, beat the egg and stir in the flour, cornstarch and salt. Pour water and mix well. Heat medium-sized non-stick pan and grease with a little oil. Pour ¼ cup of the batter and tilt pan to spread mixture evenly. When done, transfer carefully to a plate. Do the same with the rest of the mixture. Serves 8.